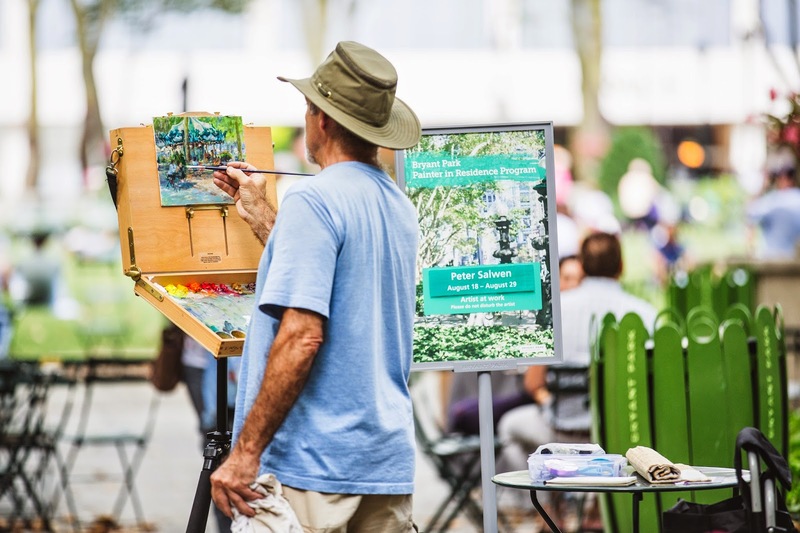 The second of our four painters in residence, Peter Salwen, took the spotlight in recent weeks to create his own Bryant Park imagery. 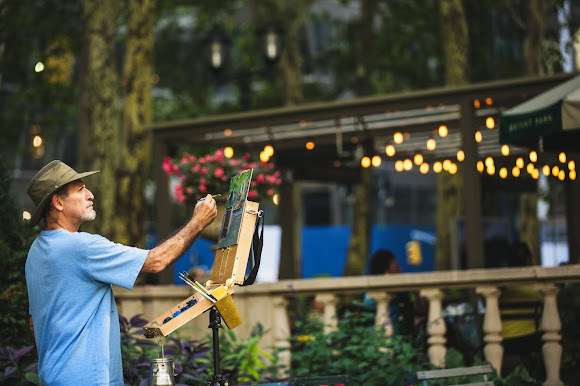 Mr. Salwen is a landscape painter, urban historian, New York City tour guide, and author. He studied at Cornell, the Art Students League, and Parson.s/The New School. Since he has started working full-time as an artist in 2009, he has shown work at the New York Public Library (St. Agnes Branch), the Kerwin Gallery, and the West Side Arts Coalition Summer Salon, among others. Mr. Salwen enjoys studying and painting landscapes, particularly urban landscapes, as he aims to "express the deep pleasure to be found in something as simple as the play of sunlight on a wall or the ordinary traffic of people and machinery at a city street." He seeks to capture a single, fleeting moment on canvas so that others may enjoy it. To view more information about Peter Salwen and his work, please visit his website or read an article about him on the New York Public Library's blog. We are only half way through our 2014 Painter in Residence Program so keep an eye out for the next two artists, Dorrie Rifkin and Anne Kullaf, in the coming weeks!